I am looking for recommendations for an omelette pan which has non-stick qualities but is not non-stick. I do not like the non-stick coating. I also do not want to make omelettes in a cast iron pan. (I already have a cast iron skillet). Any advice would be appreciated. Here are two options: a carbon (or blue) steel omelet pan and an anodized aluminum pan. Both are inexpensive. The carbon or blue steel pans work best when they are seasoned, similar to cast iron. Despite the name omelet pan, you can use it for fried eggs and other things. My local library has Julia Child's French Chef series highlights. One happens to include her omelette show. She does use a teflon coated pan (with lots of butter), which I know you want to avoid. What is more important, she is not using a dedicated omelette pan. She is using a round skillet with curved walls. She has terrific technique as well, if a French style omelette is your desire. Darren72 wrote: Here are two options: a carbon (or blue) steel omelet pan and an anodized aluminum pan. Both are inexpensive. The carbon or blue steel pans work best when they are seasoned, similar to cast iron. Despite the name omelet pan, you can use it for fried eggs and other things. Just to add a little more detail to my post. The advantages of the steel pan are (1) that is can be virtual stick resistant if it is nicely seasoned; (2) it will last a very long time; (3) it will be inexpensive. The advantage of anodized aluminum is that it doesn't need to be seasoned and it won't react with acid (carbon steel may react if it isn't seasoned; blue steel is less likely to react). The name "omelet pan" may be misleading since it is basically a skillet and you can use it for anything. You can also just get a steel skillet (not specifically referred to as an omelet pan) and use it for eggs. Forget about the name and focus on the the shape and material. de Buyer is probably the leading brand of steel frying pans. For what it's worth, I use two pans for eggs: I use a Vollrath aluminum frying pan with a non-stick surface (which I know you aren't interested in using) and a very old, seasoned carbon steel pan that looks like a cross between a crepe pan and an omelet pan. But forget about the name. It's about 8" in diameter and has short, 1" angled sides. It's great for omelets but too small for fried eggs. Darren72 wrote: Forget about the name and focus on the the shape and material. In my long winded fashion, that was the point of my prior post. In my long-winded fashion, I was agreeing with you. I recently stripped and re-seasoned my cast-iron skillet and have made a couple of omelets in it with no sticking! seems to work just fine and one less pan to buy. mhill95149 wrote: I recently stripped and re-seasoned my cast-iron skillet and have made a couple of omelets in it with no sticking! What was your procedure for re-seasoning your pan? I looked at the science/chemistry she was describing and found that what you need is a oil that has high amounts of poly-unsaturated fat. Since Flaxseed oil is so expensive, i looked for oils that had an Iodine number close enough to it. I found that Grapeseed oil is close enough in its poly-unsaturated fat content. I used it to re-season my set of nested set of Cast-iron frying pans and my wok this weekend, and the results look fantastic (so far). Now I have to see how the seasoning holds up to repeated use. Another oil you can try if you have it is Walnut oil. Hope you have not bought the flaxseed oil already. IB, I'm glad you posted this - I was wondering about the viability of grapeseed oil myself. Many, many years ago, I read that grapeseed oil has a very high smoke point and is great for high-temp use, so I used to keep some on hand for searing & whatnot. Haven't had any in a while, but I might pick some up to give wok seasoning another go (I recently seasoned a new wok with canola oil, and I'm not totally happy with the results). The type of fat doesn't really matter. I've done it with canola oil, grapeseed oil, and lard. It is important to put a few layers of fat on. It is important to wipe off excess fat after cooking each layer. Note also that if you use a fat with a high smoke point, you need to cook the pan longer (and at a hotter temperature). Remember, when you season the pan, you want the fat to break down. When you cook foods, you don't. Last edited by Darren72 on November 7th, 2011, 10:41 am, edited 1 time in total. This is really good info, tnx to everyone who's contributed. I learned about grapeseed oil and its very high smoke point during a Japanese cooking class I took last Summer in Brisbane. I found some in Kansas City, but it was expensive. But recently, it's become widely available at competitive prices, so I use it for everything now. I'll use it for re-seasoning some Lodge pans of mine that are languishing. Good!! Geo wrote: This is really good info, tnx to everyone who's contributed. I learned about grapeseed oil and its very high smoke point during a Japanese cooking class I took last Summer in Brisbane. I found some in Kansas City, but it was expensive. But recently, it's become widely available at competitive prices, so I use it for everything now. I'll use it for re-seasoning some Lodge pans of mine that are languishing. Good!! Not sure about KC, but here, the various asian markets have grapeseed oil for a steal. To be subpar as if it has been mixed with cheaper oil. Well, I found it for $13.00 for a 12 oz. container. Just for seasoning my pans, that is a lot of money. Especially when I have Grapeseed oil I cook with anyway. The fat breakdown Darren is talking about is exactly the reason for having a higher amount of poly-unsaturation. The breaking of the double bonds is what creates the points for the cross-linking fat polymerization you want to happen. Be that as it may, the grapeseed oil I used seems to really work. Now I will see how it holds up to repeated use. shorty wrote: I am looking for recommendations for an omelette pan which has non-stick qualities but is not non-stick. I've been using Matfer Bourgeat $40 on Amazon for the 10-1/4 inch pan, perfect for a three egg french omelette. Slight downside is the bottom to side angle is not rounded, not a deal breaker with a little practice. I also have a 10 inch Calphalon Contemporary non-stick fry pan which is slightly rounded and, truthfully, easier to use. I bought it at Bed Bath and Beyond for $29 less multiple coupons. I've been on a French Omelette kick lately with multiple viewings of Jacques Pepin French Omelette starts at 3:10 and is breathtakingly skillful in its seeming simplicity. Here are a couple of recent efforts. Dammit, Gary. I've broken many eggs watching that video in the foolhardy hope of getting the results you've shown above (with, I might add, a damn near identical pan – can't blame the equipment). I took my most recent run at it last weekend, emboldened by the visit of two college friends. They think less of me now and I had to double down on dinner later that night, laboring feverishly to reestablish my culinary bona fides over a hot stove while they hopefully thumbed through take-out menus at the dining room table. I know, it's just an omelette, and I have other nice qualities, but I get SO CLOSE. The heat's too high or too low, or I do something spastic with the fork or I sneeze when I'm trying to fold. And voila, another B+. But you've inspired me not to give up. As Jacques as my witness, I, too, will produce a photo-worthy Pepin omelette! 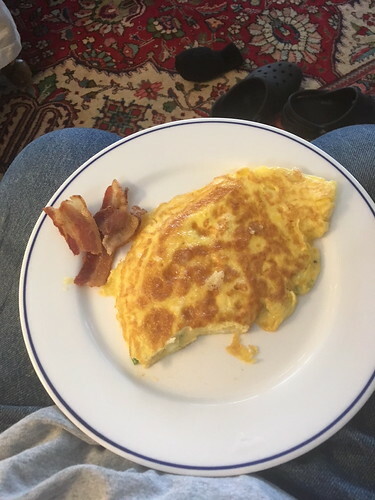 OK, I can make a cheese-and-diced-ham-filled country omlette as well as Jacques or anyone else on this planet can. I really can. But a proper French/Parisian omlette... I have to get lucky, and that is disappointingly rarely. Julia Child's early French Chef episodes featured her making a French omelette on a non-stick pan. She was very, very pleased with her pan. C2--have you got a link to that?? Geo wrote: C2--have you got a link to that?? I went back to fill it in! 30-seconds overdone. C-, French omelette, she is a cruel mistress. Bride and friend Jan home from Montreal, hungry not starving, two folded omelettes just the ticket. Starting to get the hang, 30 more and I might be happy with the way they turn out. Kicking off 2018 with a French Omelette! What type of pan are you using? Watched yet another omelette show with Julia, who used exclusively a non-stick pan. A tip I picked up on this go around: when the butter is actively bubbling, it is at 212 degrees evaporating off the water. Just as the bubbling subsides, the temperature climbs to ideal omelette making temperatures: the sweet spot where the bubbling is just about ended and before the butter browns. Cathy2 wrote: What type of pan are you using? I've tried a few different pans, I've settled on (for now) Calphalon Classic 8-inch nonstick for 3-egg French omelettes, $24.99 before using one of the endlessly ubiquitous BBB discount coupons. French Omelettes, Count me a Fan! And the beat goes on, French Omelette . . .
Geo: grow chives, render bacon grease, flip in order to brown both sides, American style.